dupont scientists have discovered that soyabeans grown in space are similar to crops grown on the Earth. 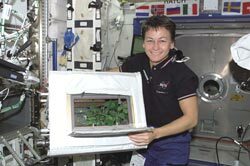 A 97-day long research, conducted on the International Space Station, was the first project during which a crop's growth cycle was completed in space -- from planting seeds to growing new ones. The experiment unleashes the ability to grow vegetation in space to support long-term human presence. According to the us-based United Soybean Board, the plant is a good source of proteins and vegetable oil, and can sustain humans for months. In June 2002, DuPont's Pioneer Hi-Bred International Incorporation, along with nasa's Wisconsin Centre for Space Automation and Robotics (wcsar), launched the experiment. Pioneer brand seeds were grown in an enclosed and environmentally controlled chamber developed by wcsar. Scientists from DuPont and wcsar daily monitored the growth of the soyabeans and provided adjustments to facilitate their growth. Through video monitoring and data telemetry, they also examined the effects of zero gravity and other elements of space on the plants' growth. The new seeds were sent to Earth in October 2002 aboard the Atlantis space shuttle. DuPont scientists conducted several analytical studies on 83 seeds. They were manually split -- one part was sown and the other half grounded to examine its biological characteristics. The seeds and their plants were thereafter compared with a number of earth-grown varieties. The researchers found that the space-grown soyabeans were physically and biologically akin to their earthly counterparts. Their developmental rate, morphology and yield levels were also the same. But they had higher sugar content, and less of oil and amino acid, presumably due to the more than normal carbon dioxide levels of the International Space Station. "When we started, we were unsure if the seeds would even remain planted in the space without any gravity, let alone grow. But the experiment clearly demonstrates that soyabeans can serve as a reliable atmospheric scrubber for long-term space travel and inhabitation," says Tom Corbin, the lead scientist.